Is this something on my end or a puzzle I am missing? It was literally the first cave I entered (in Vanilla Beach, to the left of the house and up). Anyone else ever encounter something like this? I know I could just avoid entering this cave, but should I later get stuck in walls like this, I would like to be prepared. I think that's a bug. It's not something I encountered in my play through. The so-called "1.3" patch that was recently uploaded is broken this way. It's not limited to that one cave, either. 1.2 can still be downloaded from https://zelda.qwertymodo.com/, fortunately, but I haven't found 1.23 anywhere. 1.2 was no better. Glitched overlay in ice world Ruins area. Can dash jump off screen in light world forest. Can get trapped into the palm tree on the vanilla beach. Go through the door in Blind's room and the game crashes. Defeat Moldorm in ice world too early and the crystal does not drop. 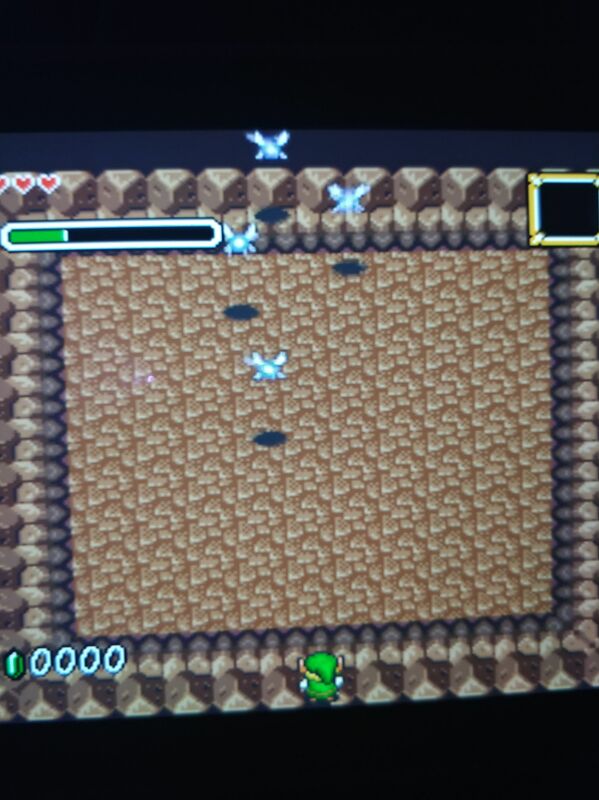 Miss out Cane of Byrna in light world and ice world Nabooru's hole is impossible to finish. Yet no code for the Lost woods is in the game to get Byrna. So you are supposed to guess the code? The difficulty of all versions of this game is also brutally difficult and the game can not be finished without save states. So unfortunately this hack really destroys everything positive about ALttP. Instead of opening this thread you should rather use the Review or Noncompliant buttons. From my memory, the Lost Woods code in the original release of Parallel Worlds at least, assumed everyone remembers the Lost Woods solution from the original Zelda. (I feel Nintendo themselves did that sort of thing in the original version of Link's Awakening, and why it gave me so much trouble as the first Zelda game I finished as a kid. Expecting knowledge of prior games to solve puzzles I would say is kind of the opposite extreme of the hand-holding they've done in later games. They had to add some more hints in the DX version. Did they? I know they made a lot of changes to demystify the game in the DX version, but I think I missed that one. I am recalling that the DX version had at least two Owl Statue hints per dungeon, compared to only one Stone Slab hint in the original. Oh, yes, that is documented. I thought you meant they added hints for the Lost Woods "puzzle". All I can say is, you'll have to figure out who actually released 1.3 if you want any answers about the new issues. I know 1.2 had its problems, and I'm working on fixing them, but I have a bunch of other projects on my plate too. It looks like puzzledude uploaded at least two patches that get you stuck in walls in the game. I tried 1.3 of Parallel Worlds and Remodel. The caves in the beginning and houses in Kakariko Villiage put you in walls. And once you move the ornamental shelf at the Guard House in Remodel, you're stuck in the wall and the dark. Can't proceed in the game. I reuploaded qwertymodo's Parallel Worlds 1.2 patch and readme, and linked to the Darunia’s Caverns patch (on his server ) so at least it works again. Does anyone have the original 1.23 patch and readme files? I got the 1.23 files and will upload. Also Parallel Worlds Remodel, does anyone have the latest (1.1 based on reviews) files they could send me? I'd hate to see newcomers download this patch and give up on romhacks because they got stuck in the wall. Thanks for the update, phonymike. Did you, by any chance, get ahold of PuzzleDude's full changelog for v1.23? I had it at one point, but can't find it now, it was a large, in-depth txt file with full hex diffs for each change he made. For the time being, v1.23 is the best version to use, but I really do want to finish v1.3 (though I guess I'll have to call it something else now, to avoid confusion over this whole mess...). If it helps I found the 1.23 version and uploaded it to the database, but for some reason it is on queue for more than a week now and won't get accepted. I did not find the txt list of changes though, but after you patch they should be already implemented in the rom. Page created in 0.079 seconds with 17 queries.